Yes, I am up to my eyeballs on Christmas gift sewing. Progress is being made on all fronts but sometimes you need to just work on something you want to finish. So I made my pillow! A gift from me, to me. 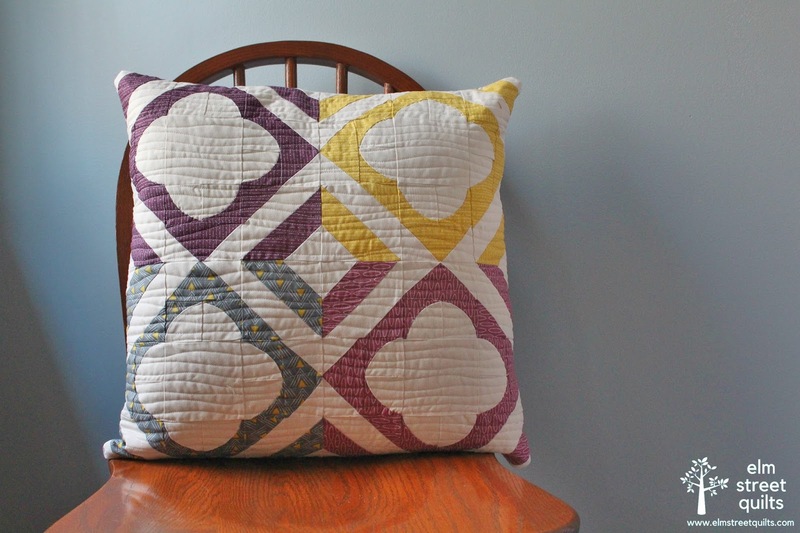 This quilt (that I turned into a pillow) design is by Melissa from Happy Quilting as part of her Roundabout QAL. I've played along with many of Melissa's QALs - her directions are great and I love her designs. I downsized everything, even doing those drunkard path blocks by hand. The fabric is from a Moda line designed by Amy Ellis. I quilted organic wavy lines with my walking foot. My quilted pillow front measured 18 1/2 x 18 1/2 '' and I stuffed a 20 x 20 '' pillow form inside. I put a zipper in the back using my tutorial. I love the way it looks on the back. Melissa is posting a parade today of other Roundabout finishes - make sure you stop by and visit! I'll be linking up my pillow with Freemotion by the River, WIP Wednesday's, Let's Bee Social, Midweek Makers. Needle and Thread Thursdays, Finish it Up Friday and Finished or Not Friday (here). Oh, Patty, it’s absolutely gorgeous! I’m so inspired! What a great gift to yourself. You gave yourself a beautiful present! It's simply gorgeous. Well done! It is beautiful!! Love the colours!! Happy day to you!!! A gift FROM you TO you. LOVE it! !